The ambitious 820,000 square foot mixed-use development by PCI Developments Corp. in­corporates two residential towers ( market condos, 46 rental housing units) on top of a three-storey retail podium, a five-storey underground parkade and a 250,000-square-foot office building with a 220,000-square-foot cinema. More than 2,000,000kg of steel and 70,000 cubic metres of concrete was used for the $372 million project. But it was a slow and arduous beginning for architects Perkins + Will, who began working with PCI Developments in July 2007 to get the project through the city approval process. The design intent was to create a new hub for south Vancouver with a full mixed use development that would capitalize on the existence of the Canada Line station, according to Perkins + Will principal Ryan Bragg. Rezoning of the 3.5 acre industrial site (which took four years) at the southeast corner of Cambie Street and SW Marine Drive to include residential was a significant concern for the city. Bragg says approval came with a number of requirements. “Part of that was the location of the residential and siting the office and retail components as a buffer between the industrial lands,” says Bragg. During the rezoning process, the city also embarked on its Cambie Corridor Plan. 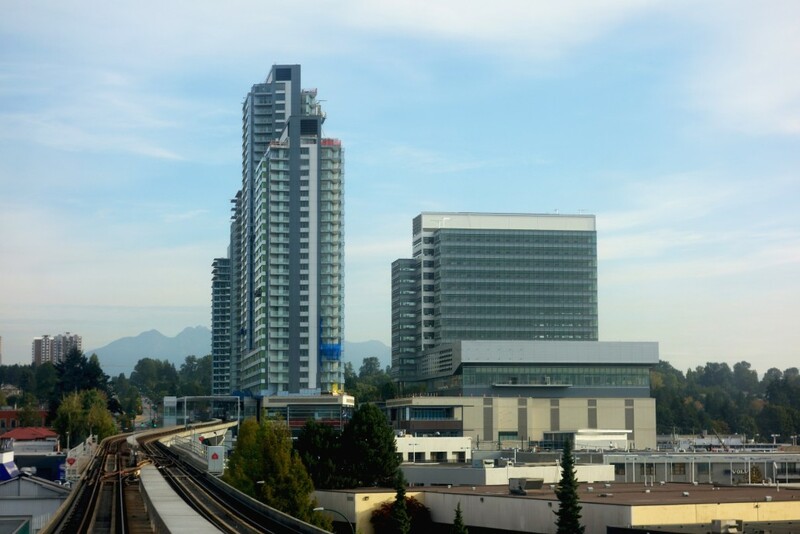 The com­pletion of the Canada Line in 2009 (third line in the SkyTrain metro network) motivated the city to take a more innovative approach to transportation and land-use planning along the corridor. The plan calls for higher density, enabling a mix of residential, commercial, and retail close to major transit hubs. “The process of rezoning and developing a project while the policy is being formed was a significant challenge,” recalls Bragg, resulting in the project undergoing many design iterations with extensive stakeholder engagement with two transit companies and the community as well. Central to the design is the seamless integration of two significant transit nodes – the Marine Drive Station and the South Vancouver bus loop (terminus for five bus routes). The project also features two public plazas at the north and south end to foster a gathering place for the local community. The concentration of pedestrian activity around the retail stores creates a unique sense of place. “We really wanted to create a space where the community can come in and make it their own. This was the space that was going to make this project a real success’ says Bragg. The office building is a counterpoint to the residential towers with its highly articulated curtain wall. “The intent was to have a simplicity and an elegance to the office tower that would juxtapose against the vitality and animation of the residential,” notes Bragg. Targeting a LEED Gold rating, the project includes a high-performance envelope, green roofs, unique shading strategies, and geothermal heating and cooling with an ambient heat recovery energy loop. The closed-loop geothermal system is expected to provide 70 per cent of the complex’s heat. The owners also partnered with FortisBC to build a central energy centre within the complex. MCW Engineering and Fortis worked together closely to ensure all the project requirements and sustainability goals were achieved in the central plant, according to MCW engineer Karen Spoelstra. A self-contained district energy system utilizing heat pumps and low temperature heating water allows the entire site to share energy between different occupancies in the building, greatly increasing energy efficiency. General contractor Ledcor Construction broke ground in 2012 and the project is on track for a fall 2015 completion. The residential towers (sold out in one day) will begin a phased occupancy towards the end of December 2015. “The interesting thing about Marine Gateway is it’s almost an equal mix of residential, office and retail. The complexities of trying to stack all of these uses together or beside one another was really a challenge,” says Bragg. “This project will impact the city in many ways… and create a vibrant hub of activity in the community throughout the day and night. It will set the bar for what’s happening outside of downtown. Making a difference in the city – that’s the legacy I hope this project provides,” he says.